Bestselling author Aprilynne Pike delightfully captures the healing power of tea with the words of her character, Laurel, in her book Illusions. At Orion Healing Centre we promote and harness the healing properties of tea. Read along to understand why. Throughout history and even in our modern times, having a cup of tea has been one of our most treasured pastimes. In recent years, however, we’ve discovered that it may have more to offer than tickling our taste buds. The magical powers of tea have habitually been credited with healing broken hearts, restoring sanity in the workplace, and making dwindling bank accounts seem like one cherry away from hitting the jackpot. Emerging data has now provided evidence of the medicinal benefits of tea which ancient wisdom–though less scientifically but more sagely–has long touted. Tea consumption has been shown in studies to aid in the prevention of debilitating chronic diseases, prevent cancer, have anti-aging properties and promote general health. This is why we include herbal teas in all of our detox programs at Orion. Tea, the world’s second most popular beverage after water, comes from the leaves of the Camellia sinensis plant, indigenous to India and China. The major tea types are based on how the leaves are processed. The four major tea types get their differences from the drying and fermentation processes. These are used to produce tea and determine its chemical composition. Black tea is fermented whereas green tea isn’t, and oolong tea is semi-fermented. Green tea is produced from young tea leaves and is slightly oxidised, white tea is barely oxidised, oolong tea is semi-oxidised, and black tea is fully oxidised. Why do any of these snooze-worthy details matter? Well, the difference in a tea’s fermentation and oxidation process gives each tea its distinct healing benefits. The complex brew of chemical compositions that make up a seemingly simple cup of tea contains catechins and theaflavins, commonly known as flavonoids, which are responsible for the healing effects of tea. Flavonoids are a natural class of antioxidants found in plant-derived foods and black tea is the largest source of flavonoids. Antioxidants clear free radicals–destabilised molecules that injure cells and cause them to malfunction causing diseases–from the body. Tea leaves have been cultivated from antiquity to present day for healing purposes. The Guarani Indians of South America introduced Yerba Maté, a medicinal and cultural drink of ancient origins, to the world. Ayurvedic tea, which combines organic herbs, plants, fruits, and spices into uniquely prepared blends, originated in India roughly 5,000 years ago. 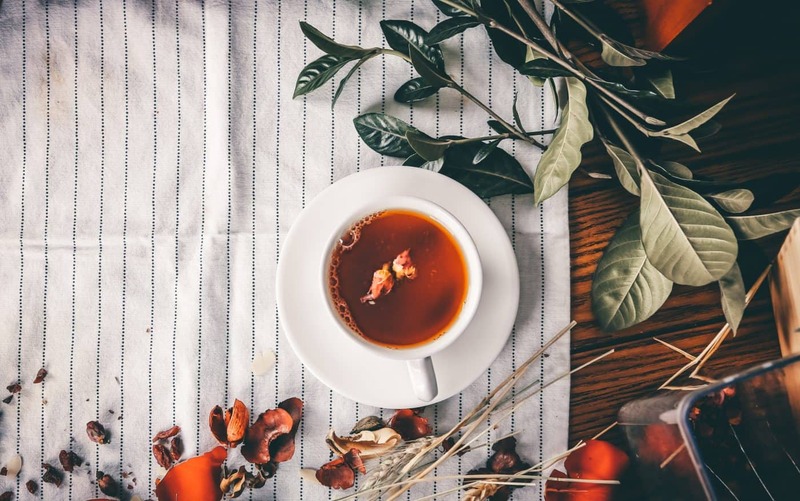 Ayurvedic wellness teas help boost energy, promote emotional well-being, support the digestive system, cleanse the body, and soothe nerves, making them an essential part of our yoga retreats. Herbs and spices are more steeped in history than tea. Herbal infusions, while technically not tea as they do not come from the Camellia sinensis plant, boast a number of health benefits. Their taste and aromatherapy effects make for a memorable experience that can be had in any of Orion’s Healthy Living Programs. Lemongrass contains anti-inflammatory agents that may prevent infections and reduce fever. It relieves anxiety and bloating while improving red blood cell levels. Mint, with one of the highest levels of antioxidant capacity, aids in indigestion, prevents ulcers by protecting the stomach lining, alleviates pain and discomfort from gas, bloating and abdominal diseases like irritable bowel syndrome (IBS). Ginger, which is offered as a “stand-alone” tea or as the final ingredient in our digestive tonic, has high levels of vitamin C, magnesium and other minerals that strengthen immunity and boosts blood circulation. It improves digestion and bloating by increasing food absorption. Ginger’s anti-inflammatory properties make it an effective muscle and joint pain remedy. Made from a combination of dried blue pea flowers and lemongrass, Butterfly Pea Flower tea is the newest sensation making a splash on the Western tea scene. Its powerful antioxidants have been harnessed for centuries in Southeast Asia to boost immunity and protect the skin against premature aging. Butterfly Pea tea’s internal anti-inflammatory properties are often used to treat common eye problems and are effective at treating pain from inflammation and combatting certain types of cancers. A popular beverage worldwide, Hibiscus tea is often used for medicinal purposes. According to the USDA Nutrient Database, it is a good source of minerals such as calcium, iron, magnesium, phosphorus, potassium, sodium, and zinc and contains a few vitamins like niacin and folate–all of which improve overall health. This tea contains anthocyanins that reduce elevated blood pressure levels and flavonoids which, along with its vitamins and minerals, have antidepressant properties. Consuming hibiscus tea settles the nervous system, which decreases anxiety and depression. Bael Fruit, also called Wood Apple, originated in India but can be presently found all over Southeast Asia where its medicinal properties are traditionally used as home remedies. It is highly recommended for toxin removal and cleansing the blood. It boosts organ activity, liver health, and your body’s metabolic speed. Bael fruit has lots of vitamin A, C, K, B6, and B12, is rich in iron, copper, other trace minerals, and is a good source of beta-carotene, thiamine, and riboflavin. The healing power of tea is an exhaustive list that unfortunately cannot be covered in its entirety here. The important takeaway is that you are just a cup of tea away from being in your best health and the detox programs at our center can get you started on your journey to good health. In the program´s Wellness Lounge you will find comfort and serenity while taking time out for reflection and enjoying our range of healthful teas. So take advantage and join us for a cup of tea, steeped of course for three to five minutes. You know, in case of Armageddon.